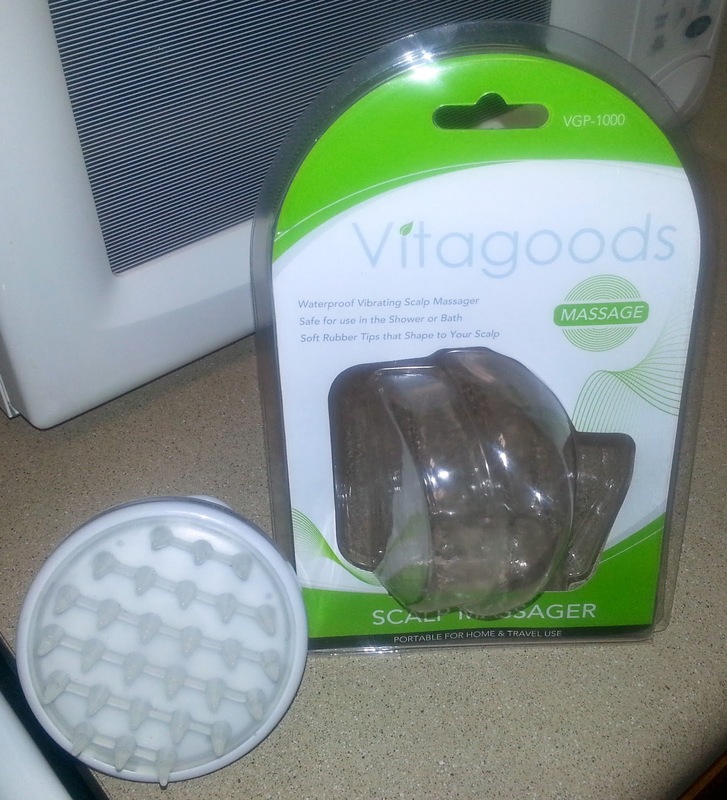 When VitaGoods contacted me about reviewing a few of their products, I was very excited. You all know how I feel about beauty products! Today's review is for an item that I have never tried before, but was anxious to use. 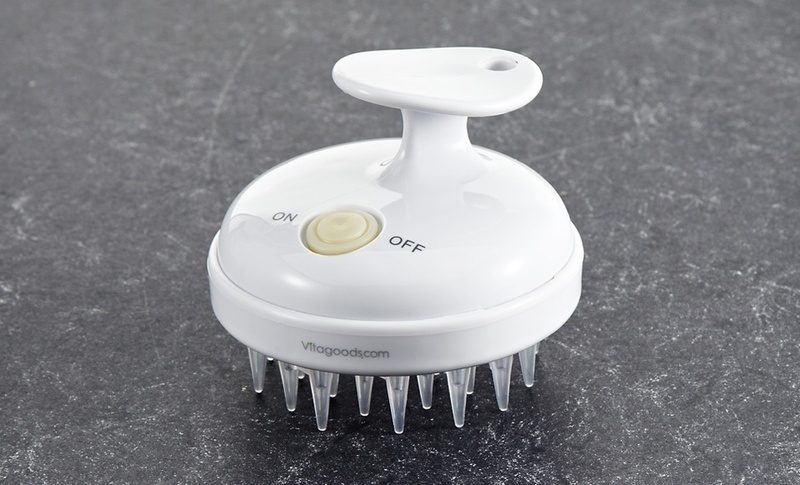 The VitaGoods Scalp Massaging Shampoo Brush is one of their newest products and this waterproof device is made to massage and cleanse your scalp. Does it do exactly what it says? We're going to explore that in this review. 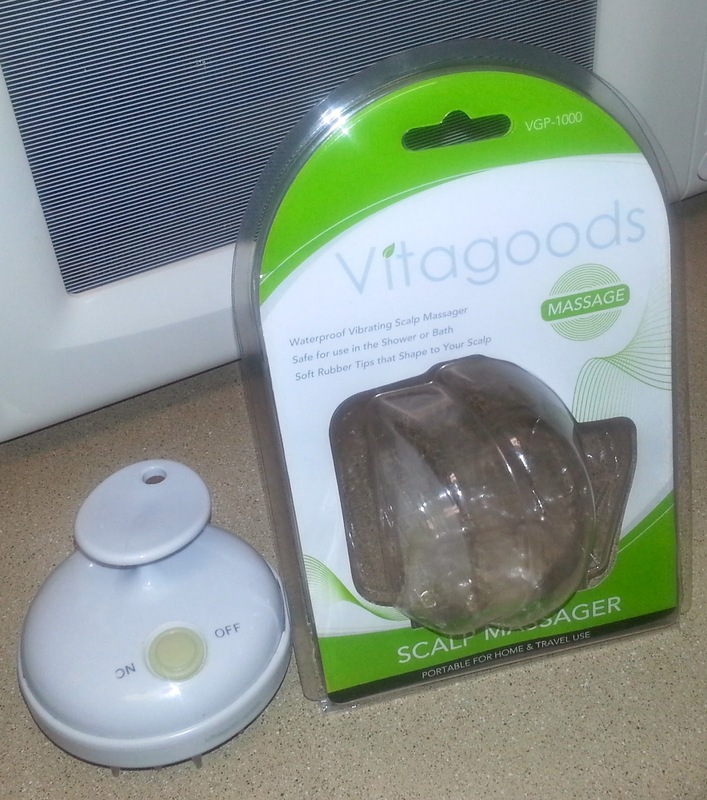 Experience the benefits of enhanced cleaning and deep relaxation with the Vitagoods Scalp Massager Brush. An enhanced scalp cleaning and exfoliating routine leaves the skin healthier, gently lifting away dead skin cells, while increasing the blood circulation to keep hair healthy and clean. Gentle vibrations combined with the soft pressure points of the comb create a unique deep massage experience that, if used when washing your hair, exfoliates dead skin cells, making you feel invigorated and ready for the day. After reading recommendations within the natural hair community on scalp massages and massagers being excellent for hair health and growth, I was pretty pumped to try this. To be honest, when I first tried to put the battery in, I had difficulty opening the compartment, but once it was opened and I had a chance to put the battery in, I was really able to give it a go. My first recommendation for this brush is to not use on dry hair. I know when you see "scalp massage" in the title, you think it can be used on dry hair. The feeling on dry hair and while shampooing your hair is completely different. With that being said, this brush was excellent in helping me cleanse my scalp. I mean... Bomb! The reason I say this is because even with shorter hair, my natural hair is still thick. I can cleanse it more easily with a shorter length, but this brush allows for an even deeper clean. Plus, it just feels plain good on my scalp in the shower. Since I have dry scalp, I also noticed that my scalp was less itchy the week following this cleanse. Yes! This is an excellent product for any hair type. I particularly recommend it to women with natural hair. With natural hair, our hair texture can be thicker and we think we're getting to our scalp when sometimes we aren't. Sometimes the itchiness experienced by women with natural hair is product residue on your scalp. With this product, it helps get rid of that and really get a deep down cleanse. I have not tried this product with a co-wash, but that will be my next quest. What do you think about scalp massaging? Would you give this device a try? Share your thoughts. Wow this product sounds amazing! Thanks so much for sharing. I mean it makes sense. My natural hair always gets scalp buildup and I worry if I really get it clean on wash days I wash without cowashing it. this sounds like a great product. One of the things I enjoy the most about going to the hair salon is when they massage my scalp. I bet this is great for getting rid of buildup. Just tried to plug in coupon code and it's not valid! Still ordered it though! But thought you might want to let people know! Hey Kimmy! Thank you SO much for letting me know about the code. I really appreciate that. I am working on it now. I hope you enjoy the brush like I do! I really want to invest in one of these! I heard that massaging the scalp is very good, and I'm sure that I would LOVE how it feels! Great review! Scalp massages are excellent for circulation and helps greatly with migraines. I've read a lot about them over the years as an aid in hair growth. Cute little product. Thanks Britton! I think you would definitely enjoy this. It cleans your scalp really well! Hey Kimmy! Just wanted to let you know that the code is working again. This seems fabulous! I like that it's battery powered. I used to have one years ago but it was manual. Looking forward to trying this out and adding to my natural hair regimen! Thanks for the review! OMG Fab! You are trying to get me to break the bank lol. I bought the spasonic, bought Eden Body Works last week...geesh lol!!! Hi, may I know what kind of batteries are needed for this product? Sorry for the delay! It takes one AA battery.